Review by Matthew Sooty Morgan on 1/13/2014. A good representation of Victoria. 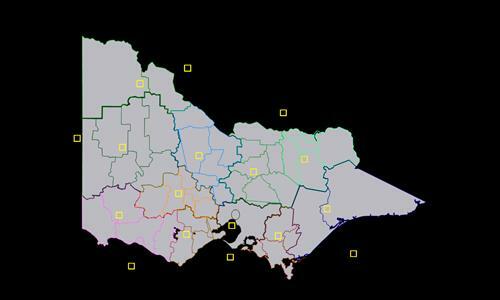 The zones are set up so that you'll fight harder over Melbourne than the other spots. Loddon and Campaspie aren't connected though. If this were fixed I'd give it 4 stars. Thank you very much for your help :) This is my first map thus I'm not so experienced in map making yet :D I know Melbourne worths lots of armies but it is around the middle of the map and has many connections so it is harder to protect..I tried to balance it this way. And I fixed the connection problem between Loddon and Campaspe. Review by Christian 'Thor' Picard on 1/18/2014. Missing connection between Gannawarra and Buloke. Good stuff - lots of fun. Thanks! Review by RiCardtheDragoon on 1/18/2014. No connection between Loddon and Campaspe though they physically touch and probably should have a connection. the map is good for fun, short games. Review by Its_A_Me_Mario on 8/2/2018.